Arboron® is factory pressed, melamine-faced, cellulose kraft paper based composite laminate, impregnated with phenolic (pheno) thermosetting resins. Sheet materials are compressed under high pressure and temperature into dense, uniform sheets with good electrical and mechanical properties. Arboron® complies with NEMA LI 1 thickness and flatness standards and is listed by Underwriters Laboratories Inc.® as industrial laminates under File E194097. 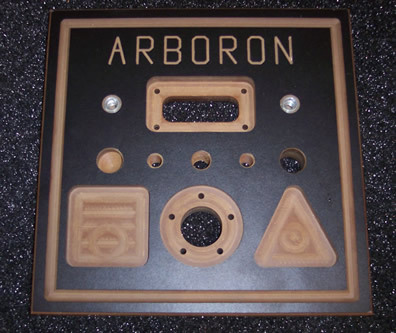 Arboron® is manufactured by an ISO 9001-2000 certified company under Card # E96516 (M), dated December 30, 1992. Arboron® is used as an electrical insulation sheet in power distribution applications where dielectric strength, low moisture absorption, chemical resistance and dimensional stability are essential. L-P-513C, FEDERAL SPECIFICATION: PLASTIC SHEET AND INSULATION SHEET, ELECTRICAL (LAMINATED, THERMOSETTING, PAPER-BASE, PHENOLIC-RESIN) (19-DEC-1968) [S/S by ASTM-D709]., This specification covers plastic and insulation laminated thermosetting sheet material used primarily for electrical insulating purposes wherein better electrical characteristics are required than can be obtained with phenolic resin cotton base laminates, but with some sacrifice in mechanical strength particularly in regard to impact strength. Laminated thermosetting sheets shall be of the following types, as specified (see 6.1): Type PBE - Insulation sheet (electrical grade); Type PBE-P - Insulation sheet (electrical grade; punching stock); AND Type PBG - Plastic sheet (general purpose grade. Arboron is not made with polyester resins or reinforced with glass filament. As a high density compressed paper based / phenolic impregnated sheet material with melamine surface, Arboron offers an exceptional anti-static dissipative material with excellent dimensional stability and superior machining capability. PCB (Printed circuit board) producers are assured that their components are protected from heat, static discharge and reduced solder defects, resulting in increased productivity and output. Maximum thickness in one section 1". Minimum thickness' 1/16", 1/8"; 1/4"; 1/2"; 5/8"; 3/4" 7/8" and 1"
(1.588mm; 3.175mm; 6mm; 12.5mm; 16mm; 19mm; 22.23mm and 25mm. Pieces may be stacked dry or glued to form thicker composite panels. Oil Compatibility Arboron shows no adverse effects on electrical insulating oil/transformer, as per ASTM D3455 test method. Arboron® can easily be fabricated using carbide tipped, standard machine tools for sawing, drilling and tapping, milling, turning and routing. from the date of sale to the first consumer purchaser.